Firstly, I'd like to thank you for this very valuable, yet inexpensive resource. My question: My Schnauzer (6 years old) developed bumps along her spine at the beginning of summer. They seem fairly innocuous, although they seem to cause some itching especially in the evening. The morphology is they start out as small white bumps about 1-2 mm in diameter. As they grow (about 1 mm in height) they turn red, then develop a hard yellow top. 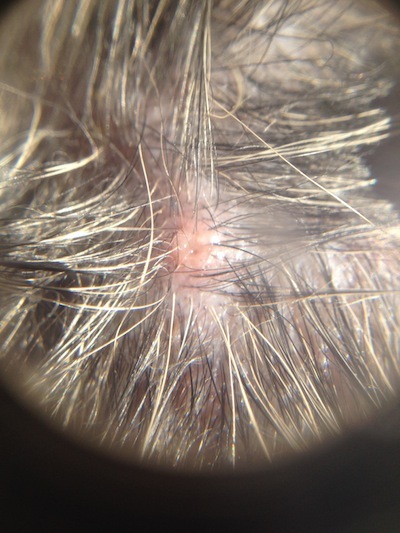 If left alone the yellow blob will crust onto the hair (BTW, no hair loss around bumps) and the now dry, slightly bloody bump, with a crater like shape where the yellow blob was, will scab over and heal. This whole process taking about 2-3 weeks. I'm currently treating with witch hazel which seems to soften the hard yellow blob into a syrupy consistency detaching it from the bump and thus speeding up the healing process. I've attached 2 pictures, the first is the crater shaped bump after the yellow blob has detached, thus will scab over in a day. The second picture is the yellow blob entangled in the hair. Normally it would be a hard yellow blob, however, I used some witch hazel to help with the picture, thus the syrupy looking state. There are a few things that this could be. I won't be able to give you a diagnosis over the internet but I can give you my thoughts. What you are describing sounds very typical of a bacterial skin infection. These are really common. A bacterial skin infection often will have pustules which will then crust over. 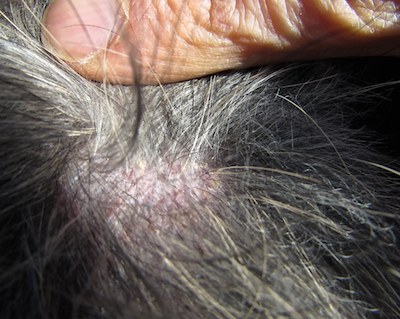 If this is a skin infection then your dog will need antibiotics either given orally or by injection. You'll need to see a vet to get a prescription for this. Schnauzers are known for getting odd skin bumps called comedones. However, these do not look like comedones. Comedones are usually black nodules and not the color that you have described. I have also seen dogs with warts that look like this but they don't usually go away and crust over. It really looks like there is a good chance there is a bacterial skin infection.